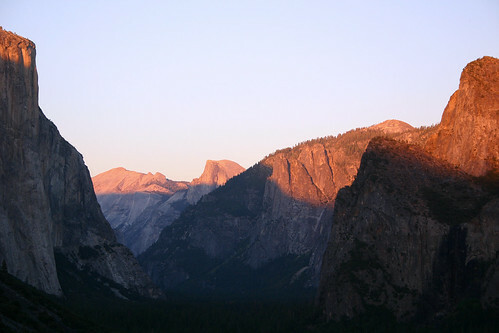 The sun’s last rays light up the tips of the mountains surrounding Yosemite Valley. Whew! We made it to Tunnel View, probably the world’s most photographed location, in time to watch a glorious sunset in Yosemite Valley. To the left is the edge of El Capitan, Bridalveil Fall is on the right in the shadow with Cathedral Rocks above it, and Half Dome sits in the middle. This entry was posted on March 20, 2008 at 6:24 pm and filed under Bridalveil Fall, California, El Capitan, Half Dome, National Park, Sierra Nevada, Tunnel View, vacation, Yosemite, Yosemite National Park, Yosemite Valley.